Shell Oil and Gazprom's oil drilling project in Russian sub-Arctic waters is threatening the survival of the critically endangered Western Gray Whale. It’s official, and I’m jumping with joy. We protected one of the planet’s most endangered whale populations from additional oil drilling near Sakhalin Island in the Russian sub-Arctic. 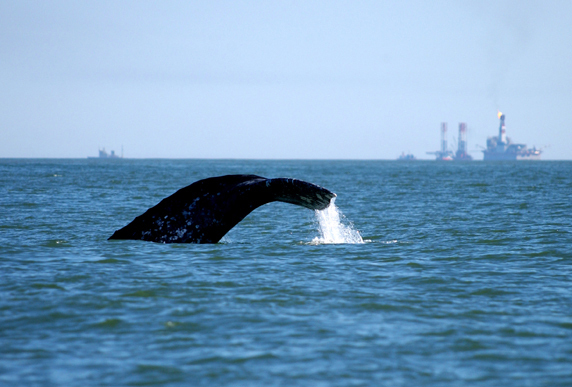 Sakhalin Energy, a conglomerate led by Shell Oil and Russia’s Gazprom, asked for two new oil drilling platforms that would have threatened the primary feeding ground of the last 150 Western Gray Whales. In response, Pacific Environment launched an intensive advocacy campaign to save the whales. Supporters like you sent thousands of emails asking the CEOs of the banks funding this oil project to honor their promise to protect the whales. And we urged international whale scientists to do everything in their power to halt these new platforms. I hope that Sakhalin Energy considered lessons learned from dangerous offshore oil drilling efforts in similar Arctic conditions when making these choices. In recent years, these “lessons” have included harsh weather, equipment failures, human error, legal violations, environmental damage, and death. In 2011, Gazprom’s Kolskaya mobile rig sank 200 miles off the coast of Sakhalin Island, killing 53 crew members in one of the worst disasters in the history of the Russian oil industry. In 2012, two of Shell’s mobile offshore drilling units went adrift and grounded off the coast of Alaska, requiring rescue by the U.S. Coast Guard. No oil company on earth is prepared to operate safely and responsibly in extreme Arctic and sub-Arctic conditions. Any attempt to do so endangers the lives of crew members and threatens the well-being of the wildlife and local and indigenous communities that call this fragile region their home. Sakhalin Energy’s decision to scrap and delay its offshore platform plans just put another nail in the coffin of Arctic oil drilling. Let’s hope we can, soon, lay it to rest forever.